Video publishers recognize the importance of a multi-device strategy, but previously no single protocol was compatible with both mobile and Web players. With player-side support for segmented streaming, one format has become hugely important for delivering video across mobile and Web browsers. HTTP Live Streaming, or HLS, is a video delivery protocol originally implemented by Apple as part of their iOS operating system. Brightcove Zencoder’s API-driven video encoding solution makes preparing content for HLS easy, but there are still a few things worth knowing that will help video publishers optimize content for their individual situation. 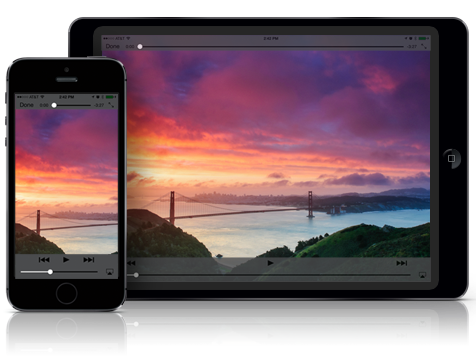 This guide provides an overview of important information about HLS video playback in browsers and mobile devices, as well as specific encoding recommendations. HLS utilizes segmented H.264 MPEG-2 TS video and M3U8 descriptor files to deliver adaptive bitrate live and on-demand video. An M3U8 file is an index that lets the client know which streams, and which segments, are available at any given time. The device automatically selects the most appropriate stream from the primary manifest file given bandwidth and CPU constraints, downloads the segment, and appends it to the playback buffer. Generally speaking, newer devices have more processing power and are able to support higher profiles of H.264. With the release of the iPhone 4S (and higher), iOS devices support 3 different profiles of H.264 — Baseline, Main, and High. It’s harder to generalize about Android capabilities because of the sheer number of devices. However, the modern, top-of-the-line Android devices at the very least support what the iPhone 4 does. 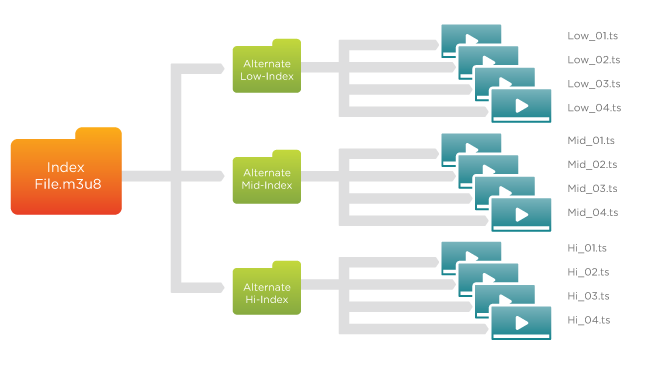 These profiles and corresponding H.264 levels are used to classify specific client playback capabilities. While these devices do not have a standard High Definition sized screen, some are able to output standard HD and SD resolutions to a television using Apple Digital AV Adapter or Apple VGA Adapter. The only browser with native HLS support at this time is Safari (version 4.0+), but a Flash fallback can be used to enable playback in others. Video.js provides HLS support in its Flash component, allowing HLS to be used across almost all browsers. Many applications and OTT devices, such as Quicktime, VLC, Apple TV, Roku, Google TV and XBMC, also support HLS. Depending on the connection speed, these devices support up to High Profile. Here are 6 tips for getting the most out of HLS encoding. These recommendations are equally applicable to live and on-demand transcoding. Use HE-AAC audio. Standard AAC (often called AAC-LC) sounds great at bitrates of 96 kbps and above, but at lower bitrates, the compression is noticeable. This is important for HTTP Live Streaming, since the App Store requires a 64 kbps stream for most apps. The HE-AAC (“High Efficiency AAC”) profile is optimized for low bitrate use, and sounds noticeably better than AAC-LC in 64 kbps range which is so important for HLS. Apple recommends that the audio parameters remain the same throughout to prevent artifacts. If the audio differs from one stream to another, the result can be skips and audible “pops” when switching between audio bitrates. If you need to provide different audio rates to improve the quality of certain streams, at the very least keep a standard sample rate. Keyframe rate should be an even interval of the segment size. For example, if the segment size is 10 seconds, the keyframe rate should be 2 seconds, 2.5 seconds, 3.33 seconds, 5 seconds, or 10 seconds. Some encoders, including Zencoder, will automatically place keyframes at appropriate places. Use the force_keyframe_rate setting with Zencoder to ensure proper keyframe alignment between streams. Pay attention to format overhead. The MPEG-TS format uses a lot of unnecessary padding, and with an unoptimized TS muxer, HLS can be significantly larger than their MP4 counterparts - as much as 10%-20% larger overall. Both Zencoder and Apple use highly optimized TS muxers that minimize TS overhead. Consider constraining bitrate peaks to ensure good streaming performance. We recommend setting a peak bitrate (bitrate_cap) that is 150% of the average bitrate, within a buffer of 3-5 seconds. HLS video consists of index files (.M3U8 XML manifests) which either reference other M3U8 files or individual video segments (.ts segments, typically 2-10 seconds in length). When using Zencoder, the base_url location specified will contain a .M3U8 manifest after the encoding job has completed. You have the option of organizing each set of segments into folders by using an individual base_url. Just make sure that the path value for the playlist portion of the API request reflects the storage location for each individual stream, otherwise your manifest file will direct to an empty location. When the client retrieves the playlist.m3u8 (primary index file), it will decide which alternate stream to play based on platform and network constraints. We want your video to look awesome, but because video compression is a subjective art form, we are only able to provide you with a set of recommendations as a starting point. Your application may be geared toward cellular or mobile devices, in which case you may want to include additional streams on the lower end of the spectrum. Alternatively, your application may be aimed at devices connected to a stronger network and can then limit the total number of streams you may need to provide. If your source material contains high amounts of panning, motion, or cuts, an increase to the video_bitrate may be required to meet your desired results. As with all things video related, let your eyes be the judge of overall quality. Use a test player and the clip_length parameter to output small test streams and tweak settings as you see fit. Don’t forget about the 6 tips listed above and your video is sure to look fantastic on any iOS device. These are just recommendations. Different resolutions and bitrates are perfectly valid, and may actually be preferable in some circumstances. For example, complex content may warrant higher bitrates, and simple content could use lower bitrates. These 6 resolutions and bitrates provide reasonably good coverage of varying bandwidth. You could certainly do more — Apple recommends 8 — so add or subtract resolutions and profiles as desired. The first column is the generalized resolution. Depending on the video aspect ratio (4:3 or 16:9), the final video will have a different resolution, which is listed in columns 4 and 5. Frame rate should be limited to 30 or below. Never force a frame rate change. To ensure smooth playback, just decimate frame rates that are too high. For the lowest stream, decimate frame rates to 15 or below. For iPhone 1 compatibility, force the use of only 1 H.264 Reference Frame for the Baseline streams. Use a keyframe interval of 5 or 10, with forced keyframe alignment. Limit audio sample rates to 44100 or below for widest compatibility. Consider limiting bitrate peaks for smooth playback. For a good compromise of quality and playback, consider a bitrate cap of 150% of average bitrate, and a buffer of 3-5 seconds. Video Concatenation? HLS to the Rescue! Sign up for your free Zencoder account. No credit card required to test. Start encoding your videos today. There was a problem connecting to the server, please try again later.